Sober Look: What caused the temporary spike in personal income? What caused the temporary spike in personal income? The drop in personal income last week got some media attention, particularly given that it was the largest one-month drop in 20 years. USA Today: - Personal income growth plunged 3.6% in January, the biggest one-month drop in 20 years, the Commerce Department said Friday. And consumer spending rose just 0.2% with most of it going toward higher heating bills and filling up the gas tank. The income drop was offset by Americans' savings a hefty 2.6% rise in December. But most of that gain, analysts said, reflected a rush by companies to pay dividends and bonuses before income taxes increased on top earners at the start of 2013. There were spending declines in January for big-ticket items that last three years or more, like cars and appliances, and non-durable goods, like clothing and food. Some economists said the declines could be blamed on a 2% federal payroll tax cut expired Dec. 31. Many immediately attributed this decline to the difference in dividend income. Companies who paid special dividend before the year-end generated an artificial one-time jump in personal dividend income in December. That made January look like a large decline on a month-over-month basis. It turns out the dividend was indeed a large portion of the "biggest one-month drop in 20 years". But as the chart below shows, it wasn't all of it. Some have attributed a portion of January's decline directly to the increase in payroll tax and higher social security payments. However, if one adjusts for all the movements associated with "government social benefits" (payroll tax, social security, veterans benefits, etc. ), the shape of the personal income trajectory remains relatively unchanged - in fact the decline in January looks worse. Anecdotal evidence suggests that just as companies paid special dividends before the tax regime change, they also paid some bonuses and other distributions to employees (mostly executives) prior to the tax increases. Moreover, it's important to remember that in December it wasn't at all clear who exactly will pay higher taxes - the discussion initially was focused on $250K/year and then $400K/year and higher. That could have impacted a much larger group than the fiscal cliff compromise ultimately did. Since there is generally some flexibility around the timing of income recognition, some people tried to shift as much of it into 2012 as possible. 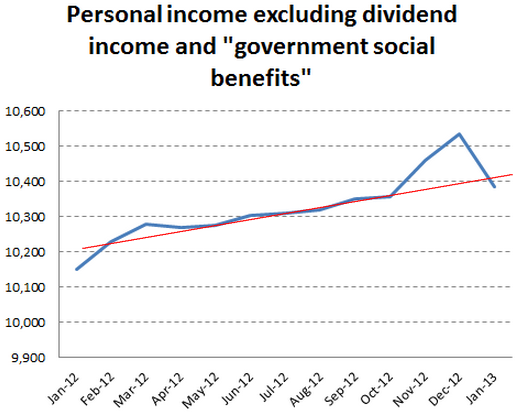 And that generated the temporary spike in personal income that can't be explained by special dividends. When all the dust settles, the reality is that personal incomes are increasing at around 2% per year or less, just keeping up with the GDP growth. For now it's simply about muddling through, as near-term economic growth in the US is expected to remain subdued. USA Today: - "With tax hikes and spending cuts buffeting the economy, growth in the first half of the year is likely to be at a sub-2% pace," James Marple, senior economist at TD Economics wrote in a note. "At this pace, the unemployment will not improve and pressure will remain on the Federal Reserve to continue its asset purchase program."